Is Salt Water OK for Babies to Swim In? Many infants show a natural affinity for the water and, of course, you want to share your love of the ocean with your baby. There is no rule that says when you can take your infant into the ocean or another body of salt water, but most experts agree that waiting until your infant is at least 6 months old is a good idea. 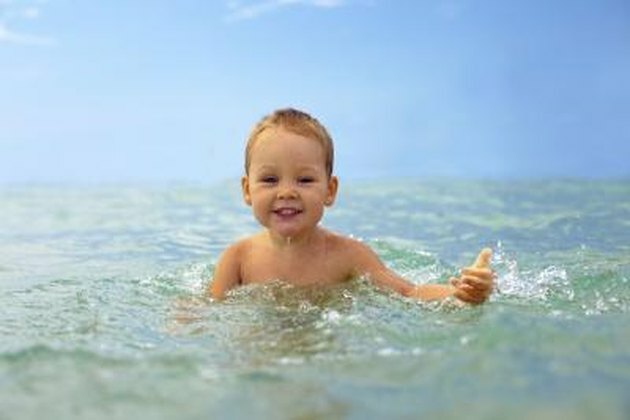 For a safe experience, skip splashing in the ocean until your baby is 6 months or older. Infants under 2 months of age may not have an adequate immune system to contend with the many bacteria in the ocean, and infants under 6 months of age are often unable to regulate their body temperatures well enough to swim in cool ocean water. In addition, an infant 6 months of age or older has good head control, so she won't accidentally put her face in the water. Some children benefit from exposure to the ocean or salt water. Infants with eczema may experience temporary relief from the itching and redness from the salt water on the skin. Salt baths are an old folk remedy for eczema. Researchers today think this temporary relief may be caused by the magnesium in the water. In addition, some researchers advocate allowing older children to experience the natural world because exposure to minor germs and bacteria can help build immunity. The ocean can be a dangerous place to swim, so take precautions to safeguard your baby. The American Academy of Pediatrics recommends avoiding very cold water or water with a current or strong flow, as you or your infant may get swept away. In addition, place a life vest on your infant in case you stumble in murky water or on a rocky surface. Do not take your infant swimming in deep water as it may be difficult to hold a squirming baby and swim at the same time. Always use sunscreen on your infant when she is outdoors. If you would like your baby to be exposed to water but you don't think he is ready for the ocean yet, try taking him swimming in a pool. The chlorine in pools kills much of the bacteria and there are no currents or rocky bottoms to worry about. In addition, many pools have lifeguards that can assist in the case of an accident, whereas many less-frequented ocean beaches do not. Babycenter: When Can My Baby Go in Oceans, Lakes or Rivers? What Water Temperatures Are Warm Enough for Swimming?